﻿ CQ WW Contest Blog » Blog Archive » When do logs come in? When do logs come in? This is the third year of the 5 day log submission deadline. Logs received within 5 days of the contest are eligible for awards. Logs received after the deadline are still included in the score listings, but are not eligible for awards or to set category records. The new deadline is being well received. 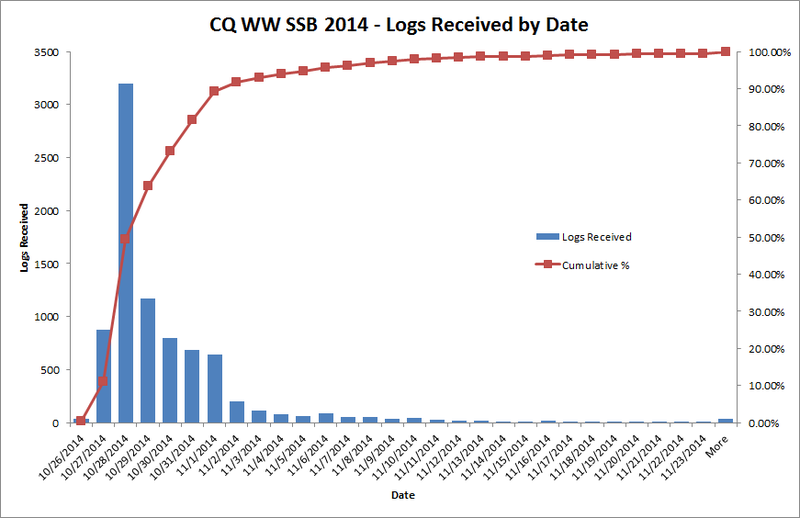 With 8,280 logs received for CQ WW DX Contest SSB 2014, over 81% were received by the deadline. Details are shown in the charts below. The contest was October 25-26, 2014. Some logs were received before the contest was over. Posted in Announcements, SSB | Comments Off on When do logs come in?